How much does it cost to develop an app like Waze? Today the capabilities of smartphones and mobile devices are probably enough to survive in the middle of nowhere. Well, at least they can show you where you are and how to get to the nearest Walmart. That is why the navigation apps are so popular. With such an app, you can find your way in an unknown city, create a route avoiding a traffic jam or help other users with navigation. According to Gartner statistic, travel and navigation category is one of the fastest growing. The survey is based on the year-on-year growth of time that users spent on apps, and this indicator reached 54%. So, if you are thinking of navigation app development, you probably made the right business choice. In this article, I am going to guide you through the features and niceties of one of the market leaders Waze app. Waze is the second most popular navigation app after Google Maps. The funny thing is that Google acquired Waze in 2013. By that time it already had over 40 million registered users, who shared about 30 million reports only in the U.S.
Waze is a full-featured navigation app. But it also has a unique crowd-sourced component. Drivers that use Waze can report accidents, road closures, traffic jams, and other hazards on the map. They also can add a photo to their note. The interface is convenient and intuitive. The search function is also worth mentioning. It works both with places and addresses and gives recommendations based on your previous entries. The interface is quite intuitive. Cute drawn icons bring even more fun to the user experience. The whole process of navigation and reporting is handy, and it doesn't take a lot of time to understand it and become a hard user. Waze is perfect for watching real-time traffic updates. Due to its crowdsource, component users on the road regularly refresh the information. Another advantage of the service is an operatively rerouting. Waze is focused more on car owners and those who drive cars compared to Google Maps that give various other options for public transport, bikes, and walks. One of the best of Waze's add-ons is a feature of police alerts tracking. Also, the app integrates with Facebook and Foursquare so that users can see their fiend’s check-ins nearby. In 2015 they also implemented an Amber alert feature that starts to work if the driver passes down the area of abduction. Alert is available only when the car is staying at one place longer than 10 seconds. 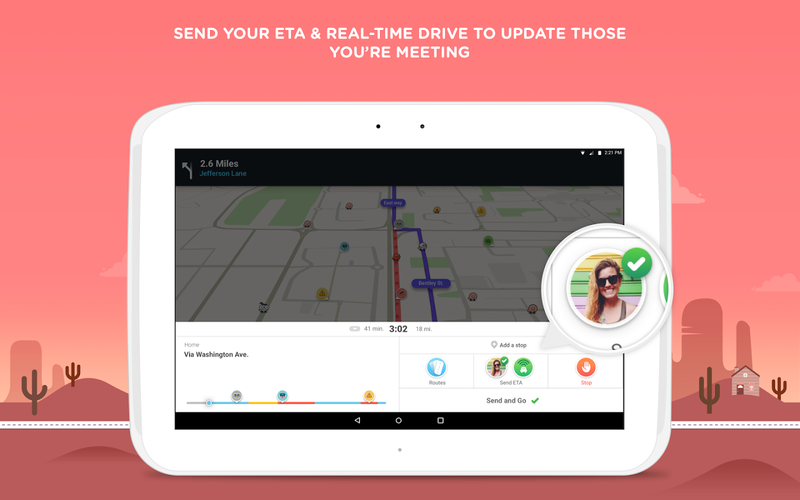 At the beginning of 2016 Waze has expanded its ride-sharing ambitions with a carpool service called Waze Rider. The service learns the most frequent routes of drivers and matches up these people with others looking for a car in the same direction. Thus drivers don't get paid as it is common in Uber or Lyft but get a small fee to cover gas expenses. The other brilliant idea is a Planned Drive feature. It recommends the best time to start a trip once you have entered the desirable time and date. All Planned Drives can be added to calendars, sent to e-mails and shared on Facebook if needed. This feature can be implemented with machine learning technology. Creating your own SDK is not the main feature when you decide to develop a navigation app like Waze. But apparently, guys have enough ambitions and resources to expand the sphere of influence. Half of the dozen companies are already included in this software to provide routing and guidance in their services. Among them are Lyft, JustPark Parking, Cabify, 99Taxis, and Cornershop. If you intend to make a traffic app, you probably were thinking about the monetization model of such kind of business. Regarding Waze, the largest amount of revenue they get from location-based advertising. This service was launched in October 2012 and earned a bit less than $1 million till the end of the year. The advertiser is usually a small business that puts a business on the Waze map and decides how much to spend monthly. When the drivers are approaching the location or searching nearby, they can see an ad. The main feature of Waze's ad is that the program knows not only location but also a destination of the user. Such an approach allows showing relevant ads along the roads towards a destination. So, if you have decided to work on a Waze app clone, it is crucial to estimate basic expenses and set up the workflow. We usually recommend choosing native app development, which means a separate application for every operating system. This allows to achieve better app performance, provide user's data security and have better access to inbuilt smartphone options such as accelerometer and GPS-tracker. The other choice that can help you to master wisely your navigation app development cost is building MVP or Minimum Viable Product. Start creating your app only with essential functionality, don't try to implement your idea and all killer features before the first release. The more important right now is to deliver the product before competitors, test your idea and start to conquer the audience. For a Waze app clone, this feature is quite important due to the fact of publicity and openness. Other drivers will likely believe in the reviews if they see real people behind them. The easiest way is to provide registration and authorization via existing social media profile. It can take about 8-10 hours of your developers’ time for each operating system. Basically, the generatrix feature for your navigation app. To implement it developers usually use Google Maps SDK as well as iOS framework MapKit for Apple apps and Android framework location APIs. It takes about 32 hours for geolocation and more 35 to create a ride feature. You may also think to implement the Estimated time of arrival (ETA) option. There is a perfect solution for this feature, especially if you are thinking about starting with MVP. The Google Maps Directions API returns a list of turn-by-turn instructions and provides human-readable notification. There is an important note, though. After the first 2500 request from your app per day, it started to be paid. The average price for the app like this starts from $25-30 thousand. It includes the work of developers, QA-professionals, and UI/UX designers. Of course, the question “How to create a GPS navigation app for Android or iOS” is more complicated. First of all, there might be unique features that can add a price. On the other hand, there are a lot of non-obvious issues like security or legislation that should be taken into account. If you have questions, you can call us and ask for a consultation with our business analyst. He can help you analyze your idea and business prospects and give a more detailed estimation.